In 1911 Texas opened a prison for women inmates. It was located at Goree State Prison Farm, in Walker County, about 4 miles outside of Huntsville, Texas. The facility is still in operation today, with a population of 874 inmates serving sentences for drug possession to murder. The average sentence is between 10 and 15 years. 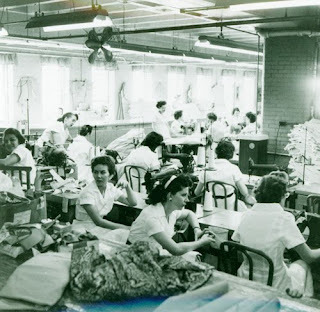 The prison was segregated, with White and Hispanic women working mostly in the linen factory. The African -American inmates were relagated to field work, growing some of the food consumed by the prisoners. By the time of the Great Depression, in the 1930's, many of the women incarcerated were there for economic crimes such as kiting checks, prostitution and drug possession. Classes were offered for rehabilitation, including typing, shorthand and beautician work. But the strangest, and perhaps best story, to come out of Goree State Prison is the one about an 8 member acoustic band that played there in the 1940's. They were known as "The Goree All Girl String Band" and played each week, not only for the prisoners, but also for a radio audience. Trisha Durant, Kathy Roberts, Erica Gilligan, Cassidy Sunderson, Billie Crow, Jill Vegas, Vicki and Farrah (no last names found) were all serving time at the farm in the late 1930's when a Fort Worth radio station, WBAP, began a program called "Thirty Minutes Behind the Walls", in which the inmates could show off their various, legitimate talents. These 8 women jumped at the chance. The show was an instant hit and remained on the air through 1948. This story is new to me. I just heard of it while reading the morning paper. Seems like there is a movie being made about the Goree All Girl String Band. It will star Jennifer Anniston and Pam Tillis. This is one movie that I will be looking forward to seeing when it is released. Meantime, I'm searching the net for some of their music. At this point I'm not sure any of the original radio broadcast recordings still survive.